(NaturalNews) Federal regulators recently made the unprecedented decision to unleash the world's first genetically-modified (GM) animal life form – a transgenic salmon species that its manufacturer claims grows artificially large, and much more quickly, than natural salmon. And this mutated "Frankenfish," known commercially as "AquAdvantage," won't be labeled on grocery store shelves or in your favorite restaurants, so you won't even know you're eating it! The U.S. Food and Drug Administration (FDA) gave its official blessing to AquAdvantage after more than five years of hesitation due to overwhelming public opposition. The agency maintains that the fake fish is perfectly safe for humans and the environment, a position that reflects the agency's longstanding rejection of all independent and contrary science presented by scientists and investigative groups who have repeatedly warned that GM animals pose a threat not only to human health, but to environmental integrity. Critics warn that if transgenic species like AquAdvantage begin to intermingle with native species – which they most surely will at some point in time – the genetic alterations that result will spread unmitigated throughout the ecosystems in which they live. And once this occurs, the effects will be permanent and irreversible, which is why groups like the Center for Food Safety (CFS) and others are now suing the FDA for its malfeasance in refusing to consider both scientific and public opinion on the matter. From a historical context, the introduction of GMOs, whether they be plants or simple organisms, has almost always had unintended consequences that weren't considered at the time of approval. Genetically modified canola (rapeseed), for instance, has rapidly become an invasive species throughout much of the upper Midwest where it's widely grown, and is now showing up "wild" alongside train tracks and highways. GMO-induced "superweeds" have also become pervasive throughout America's agricultural belt, afflicting tens of millions of acres of crop land. The situation has become such a problem for conventional crop growers that the Union of Concerned Scientists (UCS) issued a policy brief back in late 2013 warning that the problem will soon escalate into exponential territory, the damage from which will be next to impossible to undo. "It sounds like a bad sci-fi movie or something out of The Twilight Zone. But 'superweeds' are real and they're infesting America's croplands," stated Doug Gurian-Shermand, a senior UCS scientist and one of the authors of the policy brief. "Overuse of Monsanto's 'Roundup Ready' seeds and herbicides in our industrial farming system is largely to blame." "And if we're not careful, the industry's proposed 'solutions' could make this epidemic much worse." 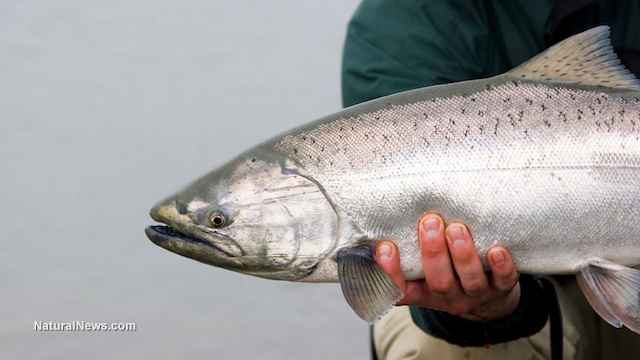 Fast forward to today, and now we're dealing with a GM animal species that, should it somehow mate with native and wild species – AquAdvantage is said to be "sterile," but even the pro-GMO group Biology Fortified admits that not all GM salmon will truly be sterile – will wreck the entire wild salmon population, possibly forever. Farmed salmon have already been shown to transfer their traits and diseases to wild salmon, even though proponents have long claimed that these inferior life forms would not harm oceanic ecosystems. Suffice it to say that AquAdvantage salmon poses the same risks, or worse, as the grand transgenic experiment moves full-steam ahead in contradiction of sound reasoning and common sense.